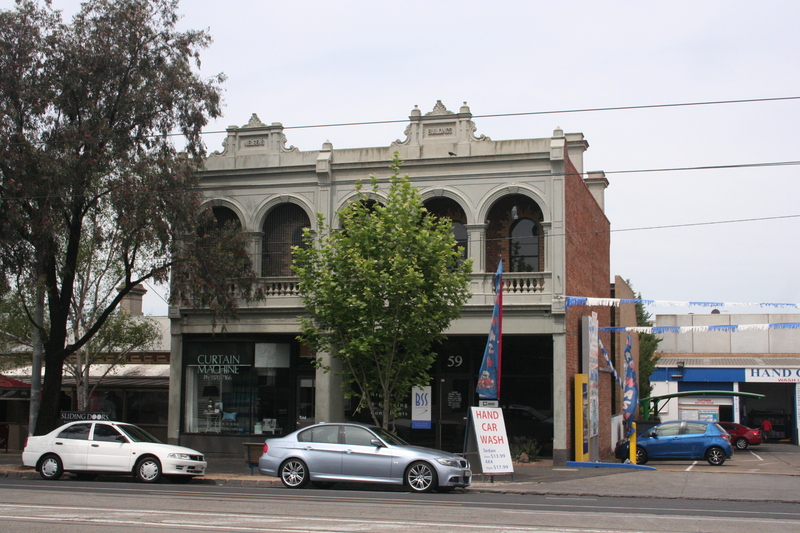 One of the aims of this walk around Melbourne is to get a sense of the different ambiances of each suburb. 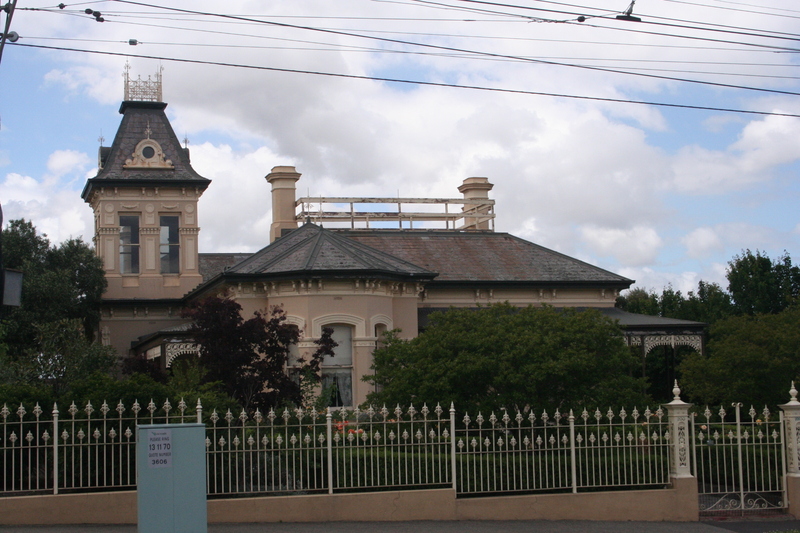 Since the 19th century, Essendon and neighbouring Moonee Ponds have been places where Melbourne’s middle classes are ensconsed. Hence the prevalence of big houses and private schools. The atmosphere is heavy with solid money and respectability. The suburb contains little evidence of industry, unlike many of the suburbs I have walked through so far. The worthies of Essendon didn’t want their neighbourhood polluted with stockyards (like Kensington) or brickworks (like Brunswick). They didn’t want anything like Footscray, dubbed ‘Stinkopolis’ due to its its factories and abbatoirs. Instead this was a place where the wealthy built elevated mansions with splendid views, and enjoyed themselves in pleasing, peaceful natural surroundings. They created reserves, and planted trees alongside the river. Queens Park is still a lovely place for a picnic or a wedding. So you don’t see a lot of the dense housing which is found in some suburbs. The typical architecture includes Victorian and Edwardian houses on sizeable blocks, along with Victorian shops and terraces. I imagine they were occupied by solid citizens with mutton chop whiskers, railing against the immorality of the working classes, then sneaking off to meet harlots in Little Lonsdale street. Bright girls were married off to wealthy dolts, and maiden aunts went quietly insane over needlework and the pianoforte. 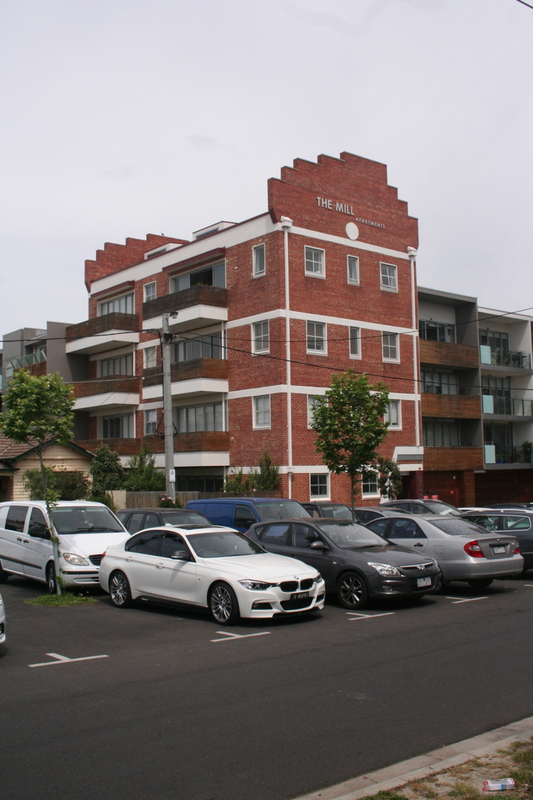 There is one significant industrial building – the former Essendon Cereal Mill, a four-storey brick building now converted into apartments. But mills and factories are a rarity. 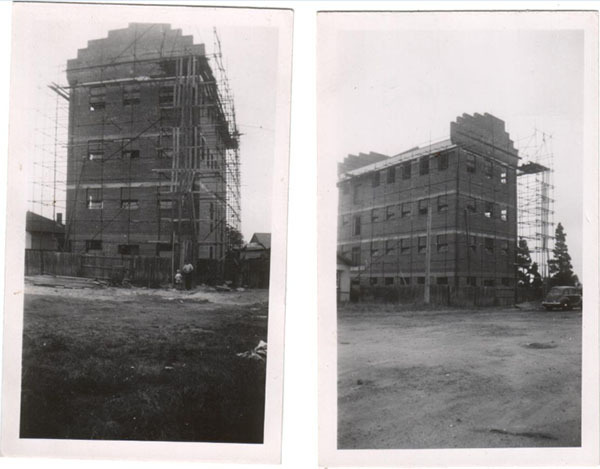 Reader Robert Hildebrandt has kindly sent me these photos of the cereal mill under construction in the 1950s. Robert tells me that the place in fact never functioned as a working mill. (For more on the firm, see the comments below). The cereal mill under construction in the 1950s. Photos courtesy of Robert Hildebrandt. Disappointingly, I could find few ghost signs. The ones I did spot were mostly practically illegible, like these on Fletcher Street. 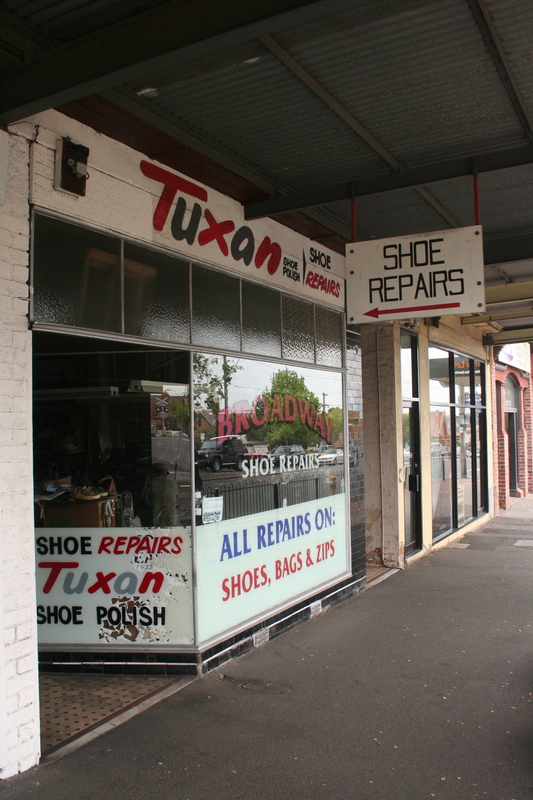 However, I did come across a charming shoe repair shop on Buckley Street, covered with advertising for Tuxan, once a popular brand of polish that would have gleamed on many a well-made Essendon shoe. There’s some good twentieth century architecture to be seen. This 1930s streamlined moderne house is on the corner of Nicholson and Fletcher streets. I love the flat roof, speed lines, and white walls. The architect Harry Winbush designed and lived in it. Harry Winbush’s moderne house in Essendon. 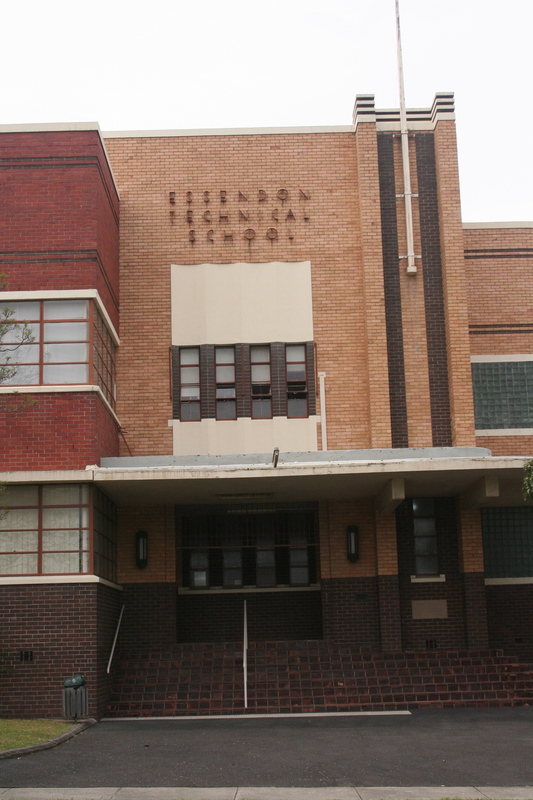 Another good building is the old Essendon Tech on Buckley Street. It was designed by Percy Everett (who also designed Collingwood Tech) in 1938, and is a decent example of European-inspired modernism. I particularly like the lettering over the entrance. 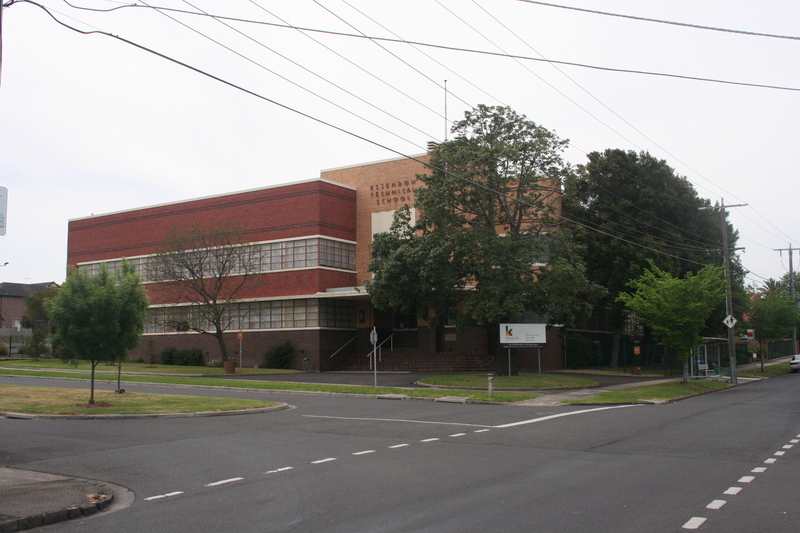 I worked in this building as an editor of ‘training modules’ for a few months in the late 90s, by which time it belonged to Kangan TAFE. 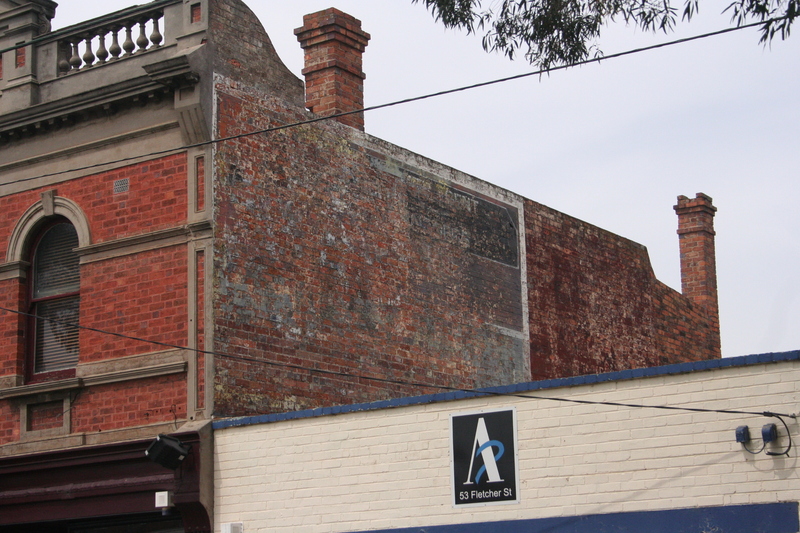 On Friday lunchtimes we used to walk up the road and bowl a frame at the old Essendon Bowl on Fletcher Street – now demolished. The bowling alley had a beautiful neon sign – but it too has gone. Was it destroyed, or preserved somewhere? Walking down the quiet back street of Leslie Road it’s astonishing to see something like a Greek temple nestling among the trees behind iron railings. It’s a monumental classical edifice with Corinthian columns, balconies, pediments – the lot. You would need a healthy ego to build something like that for yourself. The original owner was one Collier McCracken, a brewer who had it built in 1890. (That was a great year for vanity building projects in Melbourne, right at the end of the boom, just before the crash). Its original name was Earlsbrae Hall. In 1911, ownership passed to a much more interesting character, E.W. 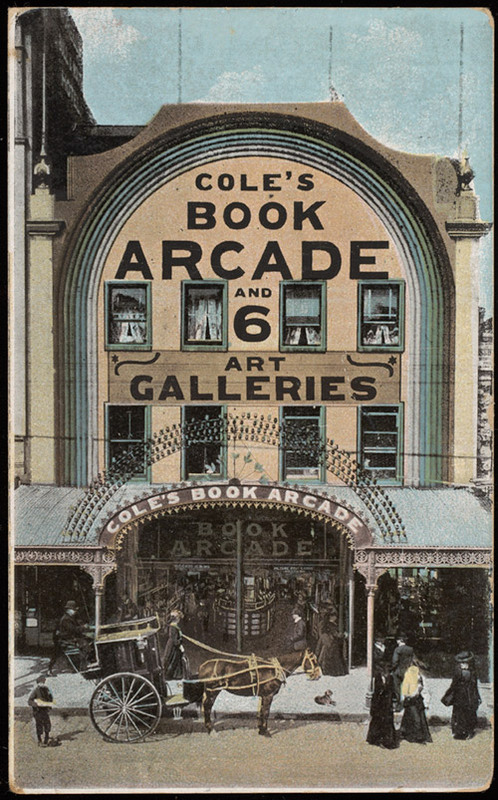 Cole, a utopian businessman and visionary, the owner of Cole’s Book Arcade and publisher of the bestselling Cole’s Funny Picture Book. Cole defied the stereotype of the wealthy Victorian businessman. He wrote pamphlets attacking conventional religion that got him denounced from the pulpit. He wanted to see a united world, all speaking the same language, with no religious divisions. Cole moved into Earlsbrae Hall with his collection of monkeys, added a vast aviary and a long floral rainbow planted in the front garden. The old man sat in his study late into the night, his monkeys frolicking around him, as he compiled anthologies from his lifetime of reading, The Cream of Human Thought Library. He lived here until his death at the ripe old age of 86 in 1918. What did they think of him, the good folk of Essendon? Did they smile or frown when he handed them a copy of his latest broadside against religion? Warn their children about the crazy man in Earlsbrae Hall? (But they all had his funny picture book in their libraries). Even the most respectable suburbs have their oddballs. 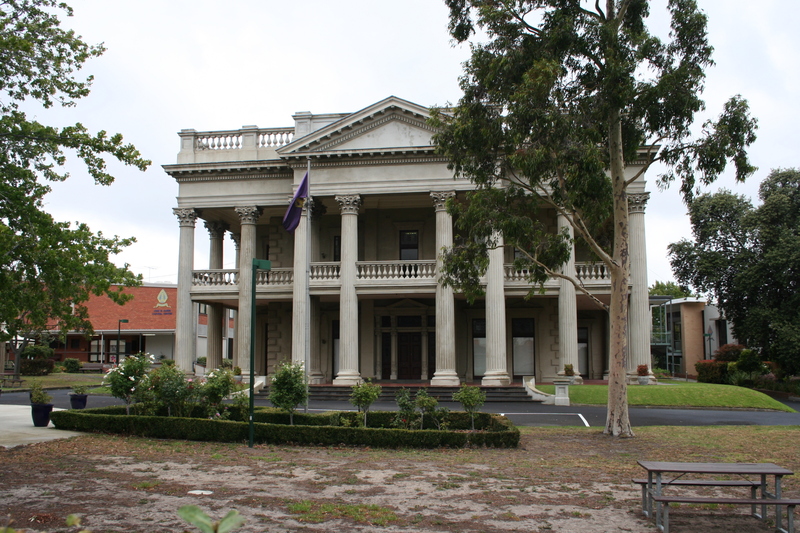 The neighbours must have sighed with relief when the house was sold to the Anglican Church, renamed Lowther Hall and remodelled as a girls’ grammar school, which it remains today. I would like to clear up some inaccuracies with your story on the Essendon Cereal Mills flourmill. My Grandfather did not “go bust”, he bought 2 of the 3 house blocks in approx 1936 after selling his flour mill in Glenroy to Robert Hutchinson (from Finley NSW) (remember, Glenroy was the sticks then). He had the machinery ordered and was in process of bulding Mill building when WW2 hit in 1939, all building work was halted and all materials were applied to war effort. It wasn’t until the early 1950’s that restrictions were lifted, he bought 3rd block of land and built the Mill . My Grandfather was buying and selling Milling machinery successfully during this time. Unfortunately due to a bad heart my Grandfather, Rudolph Julius Muller died in the late 1950’s. My father Rudolph Otto Muller ( he was until then working at the Robert Hutchinsons flour mill in Glenroy) took over the Flour Milling machinery Business, during the 1960’s he also did some flour blending at the site. This continued until the late 1980’s when I started working with my father. We shifted into making new Flour and Grain Milling equipment. 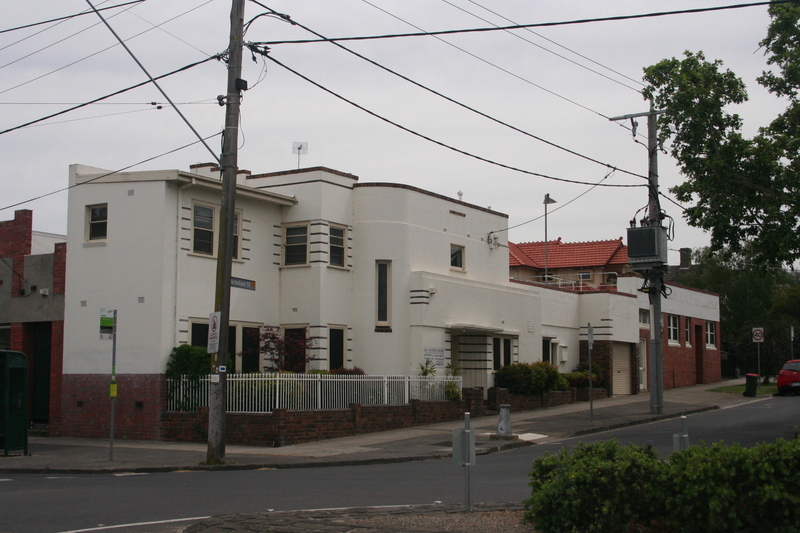 In the early 2000’s we moved our operation to Tullamarine and developed the Apartment Project. 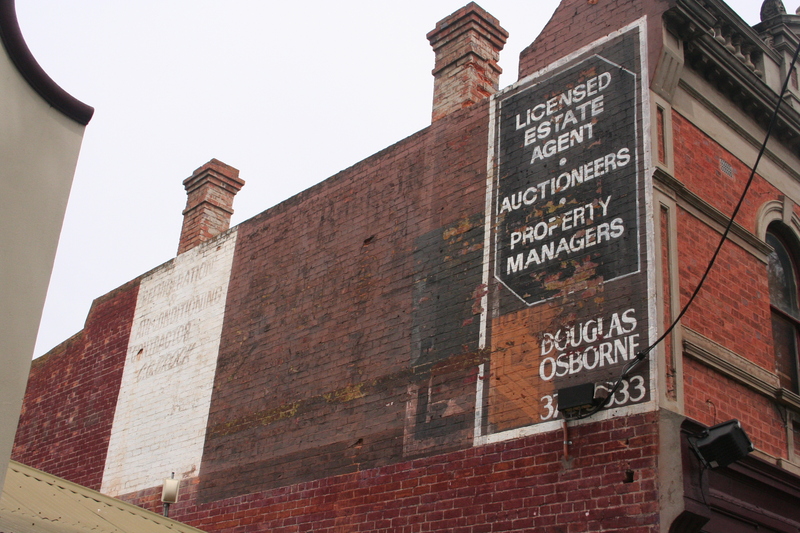 Also, the 3 pictures of the old Victorian/Federation Houses, the one with the Tower on cnr Buckley st and Pascoe Vale rd, was owned by WC Thomas, Flour Millers in Newport and Wimmera. Thank you Carl, very interesting. Post updated. Just found and very much enjoyed reading this article. 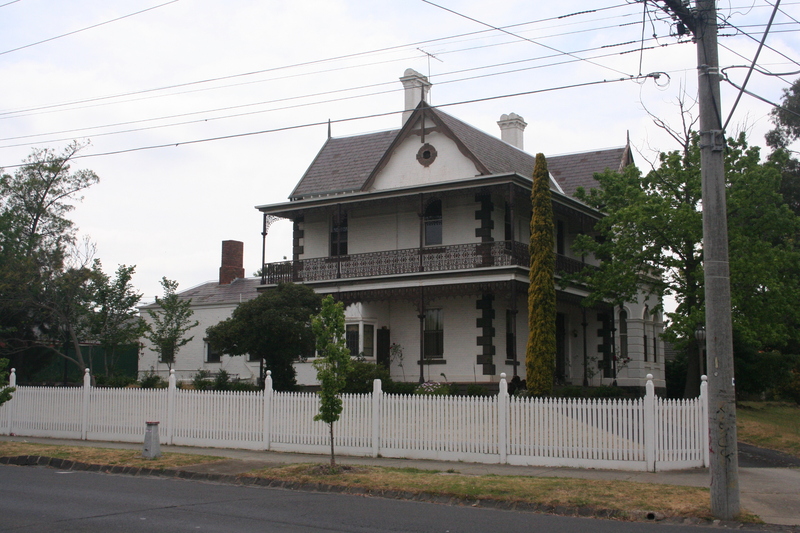 The house pictured with the white fence is on the corner of Miller Street and Lincoln Road and was owned/lived in by Miss McFarlane who used to attend Essendon Baptist Church. As a girl, I was rather scared of Miss McFarlane as she was extremely strict and woebetide if she thought you’d done some thing wrong however I still have the book she gifted to me on the occasion of my baptism.